Hostels are all about the atmosphere, and the Glenwood Springs Hostel is no exception. Enjoy being in the heart of Glenwood Springs in a shared living environment. The Glenwood Springs Hostel sleeps up to 25 and has a famous music room with over 3,000 albums ready for your enjoyment. Nestled in a beautiful mountainous valley, the hotel sits on the western slope of Colorado as a hub to Aspen, Vail, and Grand Junction. The Rodeway Inn has many room options so bring the family and enjoy free continental breakfast. Other hotel amenities include an outdoor whirlpool, copy and fax services, guest laundry, free coffee, and Wi-Fi. Each room is complete with refrigerators, microwaves, and TVs. Some rooms have hair dryers, coffee makers, irons and ironing boards. Suites with fireplaces and whirlpools are available as well. Fireplace availability is seasonal. 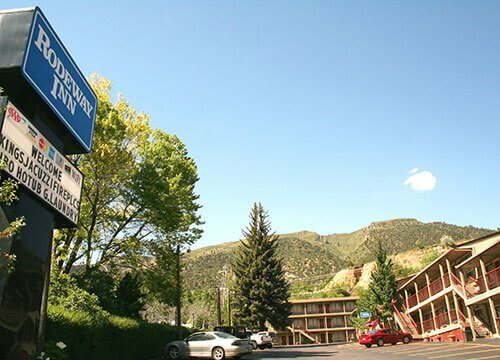 The Rodeway Inn considers your budget, so you can focus on the experience of Glenwood Springs and not your wallet. Book today!